Learn the right way, the easy way, the first time. Ok, this article is the reason you’re here. We’re going to dive into beginning guitar notes in the open position. In guitar-speak, the open position is the first three frets of each of the six strings. If you follow the system I’ll give you at the end of this article, you’ll be able to learn all the beginning guitar notes in the open position in 20 minutes. Think of this graph as a picture of the fretboard if you’re looking at it straight on. The line farthest to the right is your first string, high E. That’s the thinnest one. The line farthest to the right is your sixth string, low E. That’s the thickest one. The letters above the graph are the names of the open string notes. And obviously the letters on the fretboard are the names of the notes at those frets. Don’t try and memorize these all just yet. At the end of this article I’m going to give you some foolproof ways to learn these without a lot of hassle. But we need to add one more thing into the mix. You need to also know what these notes look like on a staff. You see, there are four parts to a note: What it’s called, where it goes on the guitar neck, what it looks like on the page, and what it sounds like. If any of the first three of those are missing, you’ll run into trouble later when trying to learn new songs and communicating with other musicians. Remember our “FACE” technique of how to read guitar notes? That bottom space F is the 3rd fret on your fourth string. As you go up the scale, you’ll go forward in the alphabet. Down the scale is backwards in the alphabet. Action Step: Now that you’ve got all the information, we need to make sure it’s organized correctly in your brain. Here’s the system for learning these notes really easily. 2. Play the notes, while saying the names out loud and looking at them on the staff. It’s important that you be looking at the notes as you’re saying and playing them. That connects all four aspects of the note in your brain easily. You may feel like you need to look at your guitar, but try doing it without. You’ll make a few mistakes, but that’s totally ok. After a couple tries you’ll have it. 5. Repeat again with groups of 3 strings. 6. Repeat one last time doing all six strings. Once you’ve gone through all six steps, I guarantee you’ll have the open position beginner notes for guitar totally taken care of in 20 minutes or less. Now you can start applying them to songs! Now it’s time to learn how to read rhythm notes! Get my guide to the “12 Parts of Playing Guitar You Need To Know” plus “The Perfect Practice Session” by sending out a quick tweet with the Tweet2Download button below. how do i get mel bay model guitar grade 1 in nigeria pls i need it, i love guitar. Hi Samuel… Ok, I did a little research and it looks like both SheetMusicPlus.com and Amazon.com will both ship to Nigeria. It does make the book a little more expensive though. You may be able to keep up with it without paying international shipping prices. If you can find a guitar method book that takes you through the open position, one string at a time, and gives practice pieces along the way, you’ll be in good hands. As well, I’ll be creating similar content here on GNFBHQ. And since you asked, I’ll get to work on that soon. So be sure to bookmark and come back soon. 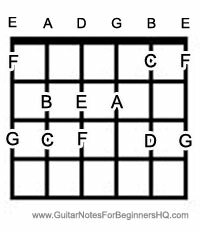 Hi ive been teaching my self guitar for anfew years now and since i skipped over the reading music ajd basic theory infeel like im not asngood as i should be. I basically just learn songs from tabs and have no idea why things sound good. Now im trying to learn the basics but find it hard to consintrate since i can play stuff anbit more complex. Any tips for a guy like me? For each new bit of basic knowledge you pick, go back into the songs you already know and see if you can spot that technique at work. So, let’s say you’re studying intervals. You’d want to go back into pieces you’ve already learned and try to understand it in that new light of intervals. Learning an idea or skill in a vacuum isn’t all that interesting. But if you always go back and put it in the context of real songs, it’ll both be more interesting and stick with you better. 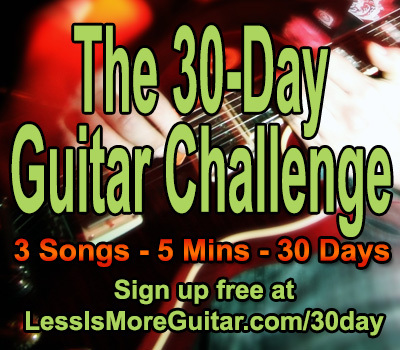 Click here to learn the best way to learn guitar and put me out of business. How Long Will It Take Me To Get Good At Guitar?